A large group of fans watch the play around the par-three 16th hole during the third round of the Waste Management Phoenix Open at TPC Scottsdale on January 31, 2015 in Scottsdale, Arizona. When Jerry Lewkowitz joined a Phoenix civic group called the Thunderbirds in 1962, Arnold Palmer had just won his second consecutive Phoenix Open. The following year, Palmer won it again, and in ’64, some guy named Jack Nicklaus prevailed. That was before the enclosed par-3 16th hole, before the raucous party atmosphere, before the Phoenix Open became the wildest scene on the PGA Tour calendar. The tournament was then held at Phoenix Country Club, and there were no grandstands filled with rowdy fans chugging beers, only a few tents and no big name players. By 1971, when Lewkowitz, now 86, chaired the tournament, Nicklaus and Palmer were two of the biggest sports stars on the planet and the little tournament in the desert, run by the Thunderbirds, was hardly even on their radar. Lewkowitz flew to California to try to convince the game’s headliners to make a stop at their desert event after playing in the Crosby Clambake at Pebble Beach. Nicklaus was unfazed by the pitch. “He didn’t hit me with a 9-iron or anything, but Jack said, ‘I’m not coming there. The tour should start in Florida and end in Phoenix,'" Lewkowitz said. But after playing well at Pebble, Palmer’s pilot, doubling as his personal assistant, called Lewkowitz to say Palmer would come to Phoenix. Palmer wouldn’t need a rental car because he has a deal with Lincoln, and his hotel was also already taken care of. Arnie’s lone request: to play in the pro-am with Dell Webb, Bob Goldwater (the founder of the tournament and less-famous brother of Barry), and Bob Hope. Lewkowitz panicked. The Thunderbirds had been trying for years to get Hope to come out and were rebuffed each time. It’s hard to believe now that a tournament that gave $9 million—all of the event’s profit—to charity last season and has become one of the most popular stops on Tour ever had to beg big-name golfers to make the trip. More people can now fit on the famous 16th hole than would come to the tournament back in the 1970s. 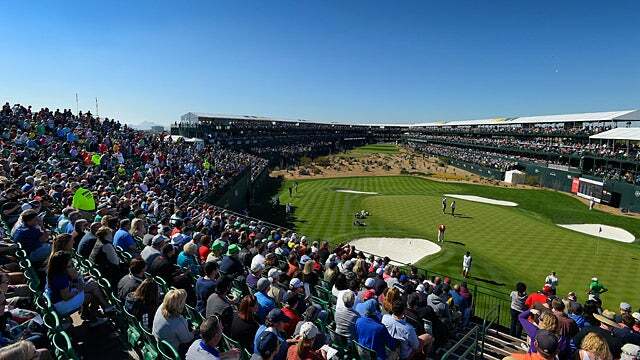 The explosion of the Phoenix Open into the most fan-friendly, fun-filled atmospheres in the sport is a success story that should make many other PGA Tour stops envious. The “people’s major,” as it’s been dubbed, has become the biggest, baddest bash in golf, part by necessity and part by design. The West Coast swing featured heavy hitters in the golf world: Pebble, Torrey, the myriad courses in Palm Springs. They were the power players of the early season. But a small group of players liked coming to Phoenix because it had a unique energy. The Thunderbirds, a mainstay in the community dating back to the 1930s, ran the event with the goal to raise as much money as possible. Today, the chairman is swapped out yearly, so the guys running the show are constantly trying to one-up each other. “Beat last year’s figures, that kind of attitude, has really enhanced the tournament,” Lewkowitz said. "Some civic groups have the same leadership forever and it gets better," former chair Mike Kennedy said. "Some do, some don’t. But you basically eliminate the complacency factor the way we do it. The status quo is not typically acceptable." Witness the Bird’s Nest, a social event built around the tournament. At first it was just a tent over the tennis courts with live music and “energy” (in this case, potentially a code for “booze”). It attracted a certain type of fun-loving tour pro and became a staple of the tournament. This year, country music star Dierks Bentley will perform Thursday night for a sold-out show in front of thousands. 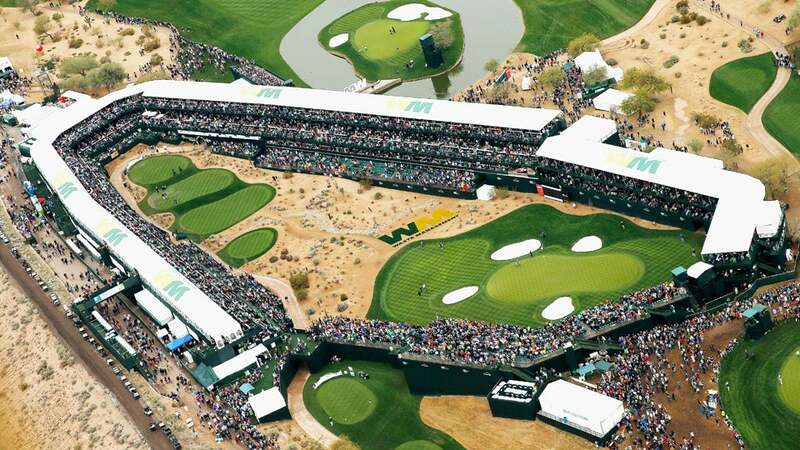 In many ways, the growth of the Phoenix Open mirrors its host city. The tournament moved to TPC Scottsdale in 1987, an area of Phoenix had left mostly undeveloped. "I said ‘This is absolutely ridiculous no one’s going to come out here.' Obviously I was wrong about that," Lewkowitz said. "We wondered if people would come,” Kennedy says, "but one of the primary objectives was to try to continue the energy beyond the golf. Not only did that happen – it happened immediately – but it’s been the last 10, 12 years that this thing has exploded." “Energy beyond the golf.” More code. The party, and not just the Bird’s Nest. In order to entice players and spectators, the Phoenix Open had to adapt or risk becoming obsolete. A niche market among players as a fun spot to have a couple Rob Roys and play some high-desert golf isn’t a long-term business model. Players and fans still had to want to come. The tournament still had to matter. Thanks to one magical Tiger Woods moment in 1997, the tournament reached a new level. “The skyboxes around 16, you know what made that? Tiger’s hole in one.” Lewkowtiz says. As that par-3 drew more attention, the Thunderbirds decided to build the skyboxes that have become synonymous with the Phoenix Open. Like other sports, golf has learned that big money comes from luxury boxes for sponsors, advertisers, and corporate heavyweights. Before the 2016 tournament, the fire marshal told Mahoney and the T-birds that the 16th hole had reached capacity. Their solution would make a Manhattan resident proud: go up. They’ve added yet another deck (now three) to create an even grander stadium stage. 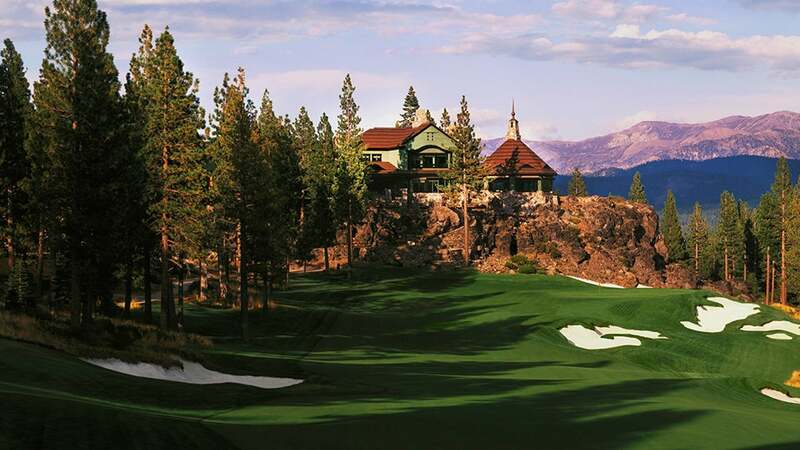 The hole can easily fit 15,000 spectators and regularly draws capacity crowds, creating one of the most unique and raucous settings in golf. It’s the closest thing the PGA Tour has to a student section. “People have been calling us the people’s major,” Mahoney says. “We obviously want it to be an acceptable environment for the players and not have them constantly harassed, so we always try to wonder how to balance the frivolity, with the proper respect for the players. The “fun” results in a self-building win-win: more people and pros want to be a part of the event because it’s such a great time. That in turn creates more revenue for the community while also allowing the Thunderbirds to upgrade the tournament to make it bigger and better every year. When the Thunderbirds mulled changing the tournament from Super Bowl Sunday, the PGA Tour insisted they were the perfect tournament to go head-to-head with the biggest day in sports. The numbers back them up. Each of the last two Super Bowls in Phoenix have buoyed revenue numbers for the Phoenix Open, and Kennedy was even chair of the 2008 Super Bowl committee before helping the city make a bid to the NFL for the 2015 Super Bowl it eventually won. Kennedy expects the 2016 tournament to match the 2015 revenue levels, despite usually seeing a decline post-Super Bowl years. And as far as Kennedy sees it, there’s no ceiling in site for the growth of the wildest party on the PGA Tour.